Like many AVAs, Paso Robles was established in haste to create an appellation that would allow for the estate bottling designation, and to identify the region in which the grapes were grown. The Paso Robles AVA was formed in 1983 as a result of a political process that sought a consensus on its boundaries. The result was the creation of a large appellation of convenience, to accommodate virtually all the existing vineyards and wineries in northern San Luis Obispo County at the time. The appellation is situated roughly in the center of the Central Coast, halfway between Los Angeles and San Francisco. The area lies on the inland side of the Santa Lucia Coastal Mountains in San Luis Obispo County, and forms a kind of rectangle 35 miles wide by 25 miles long. It extends from the Monterey County border at the north, to the Cuesta Grade below Santa Margarita at the south, and from the Santa Lucia Mountains at the west to the Kern County line at the east. The entire region encompasses more that 650,000 acres. The large appellation covers many different, distinct grape-growing areas. The variations in soil type, annual rainfall, altitude, maritime airflow and daily temperature are just a few of the significant differences within the various Paso Robles vineyard areas. Those not familiar with the idiosyncrasies of Paso Robles often try to simplify the vineyard areas as "east" and "west" of the Salinas River. 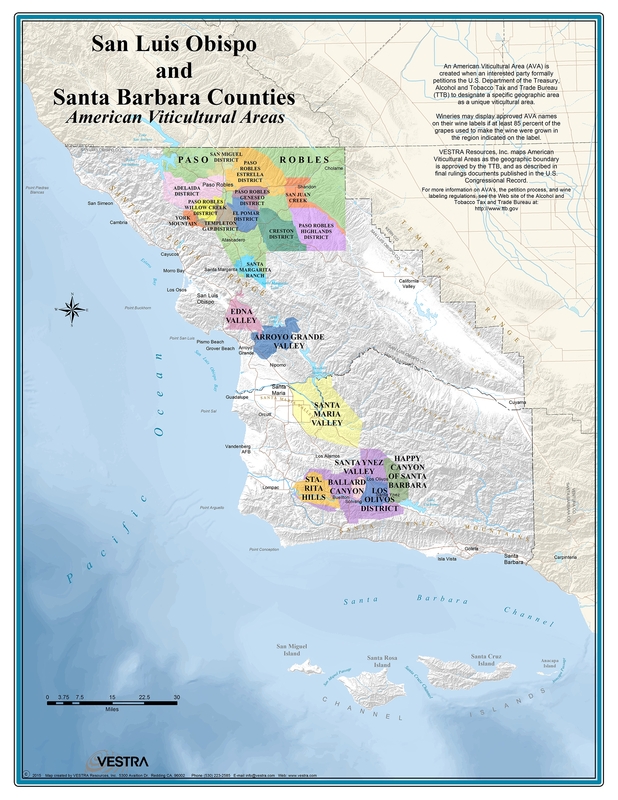 In fact, greater differences exist between the soils and climate of San Miguel in the north and Santa Margarita in the southern end of the Paso Robles AVA. There are several distinct viticultural growing areas in Paso Robles, and there are several sub-AVA petitions being filed with the Federal Tax and Trade Bureau (formerly the Bureau of Alcohol, Tobacco and Firearms). Paso Robles has had great success with a number of red varietals: Merlot, Cabernet Sauvignon, Syrah, and Zinfandel in particular.